Current and expanding human activities are moving us towards ever deeper unsustainability. While there is no single, simple means of reversing the invidious biophysical trends and redirecting the distribution of benefits, one necessary step is to approach every new and renewed undertaking as an opportunity to deliver maximum multiple, mutually reinforcing, fairly distributed and lasting gains. Finding the best options for enhancing such gains by comparing alternatives, addressing all the key requirements for progress towards sustainability and avoiding significant adverse effects, is the essential purpose of sustainability assessment. 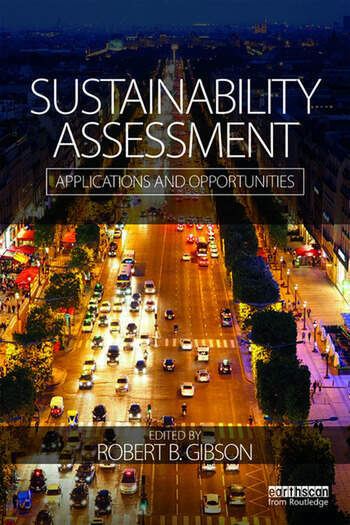 This book addresses the theory and practice of sustainability assessment applications, drawing from experiences globally in a variety of sectors and presenting lessons learned. Diverse international case studies from professionals and academics demonstrate progress so far in exploring openings, testing approaches to application and establishing best practice. The book illustrates means of specifying generic sustainability criteria for the context of particular applications, reports on the resulting insights, and examines the barriers and opportunities for further advances. This book is an important resource for students, academics and professionals in the areas of Governance, Environmental Assessment, Planning and Policy Making, Corporate Social Responsibility and Applied Sustainability. Robert B. Gibson is a Professor at the School of Environment, Resources and Sustainability, University of Waterloo, Canada. He has been involved with environmental policy issues and broader sustainability imperatives as a practitioner, advisor and academic since the mid-1970s. His initial book on sustainability assessment, focused on criteria and processes, was published by Earthscan in 2005.